KMCH stock made its life time high of Rs. 1090 recently and today closed at Rs. 1059 giving absolute returns of 890% to our members, our 10-Bagger stock in period of 5 years. In Sept'16 quarter, net profit of Kovai Medical Center & Hospital rose 59.42% to Rs 17.01 crore against Rs 10.67 crore during the previous quarter ended Sept 2015. Sales rose 17.16% to Rs 136.36 crore in the quarter ended Sept 2016 as against Rs 116.39 crore during the previous quarter ended Sept 2015. Company has good consistent profit growth of 27.3% over 5 years. Moreover, company has a good return on equity (ROE) of 29.5% during last 5 years. 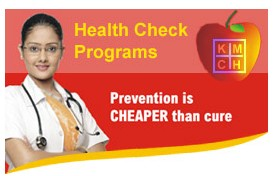 Kovai Medical Center & Hospital has given returns of 840% and is a 9-Bagger stock for our Hidden Gems members in last 5 years. Moreover, there are total 39 Hidden Gems stocks out of 52 published by our equity analysts till Dec'15 which have given returns in the range of 100% to 1900% to our members during last 6 years. We would like to inform our readers that prices of our subscription services will increase from 31st Jan 2017. You can subscribe before 31st Jan to avail the maximum discounts. 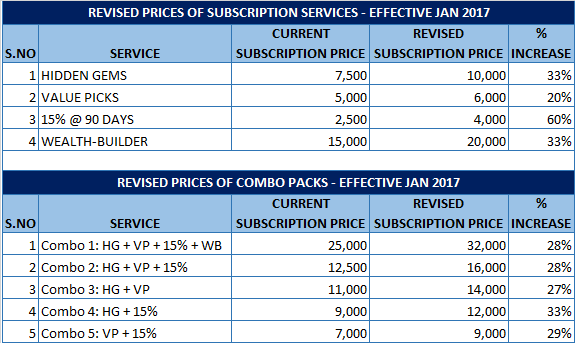 Below table indicates revised subscription prices effective 31st Jan 2017. This is the last opportunity to subscribe to our services at old subscription prices as you would not be able to avail these discounted prices after revision of our subscription prices by end of this month. Our existing members can also extend their subscription by 12 months. Being an existing member, if your subscription expires in any month of 2017, it will get extended by 12 months and will remain active till respective month of 2018. Below are the details of our annual subscription charges currently which will increase on 31st Jan'17. Click on SUBSCRIBE! link to subscribe to our services online using debit / credit card or net banking facility.